Washington • President Donald Trump, who blasted the Antiquities Act in carving up two Utah national monuments nearly a year ago, used the authority under that law Friday to name a new monument in Kentucky days before the midterm election. Trump, who shrank the Bears Ears and Grand Staircase-Escalante national monuments in Utah by 2 million acres in December, employed the Antiquities Act to create the Camp Nelson National Monument in Kentucky, protecting the historic site that has local and congressional support but prompting critics to say the move was purely political. Camp Nelson — a former supply depot and Union Army hospital that served as a recruiting center for African-American troops and a refuge for freed slaves — sits inside a House district where incumbent GOP Rep. Andy Barr faces a close race against Democrat Amy McGrath. “Camp Nelson and its role in our nation’s journey from Civil War to civil rights deserves to be protected, full stop,” said Kate Kelly, public lands director at the left-leaning Center for American Progress and a former senior Interior Department official. The Camp Nelson monument is the first Trump has designated under the 1906 law that has been used by every president since Teddy Roosevelt to preserve public lands. Last December, Trump flew to Utah to severely diminish the size of the Bears Ears and Grand Staircase monuments created by Presidents Barack Obama and Bill Clinton, respectively. In doing so, Trump joined a chorus of Utah GOP elected officials charging that the Democratic presidents had overstepped their authority and were denying the voice of locals. Unlike the two Utah monuments, the new one in Kentucky has support from local officialdom, and the House overwhelmingly passed legislation sponsored by Barr to turn the camp into a monument. The Senate has yet to pass companion legislation. The Camp Nelson monument is tiny compared to Utah’s now-smaller monuments, 525 acres total as opposed to 1 million acres remaining in three parts of the original Grand Staircase monument and 200,000 in two pieces of the Bears Ears' initial designation. Rep. Rob Bishop, a Utah Republican who heads the House Natural Resources Committee and is a strident opponent of the Antiquities Act, noted Saturday that more than 400 House members had voted for Barr’s legislation to create the monument and that it enjoys local support. 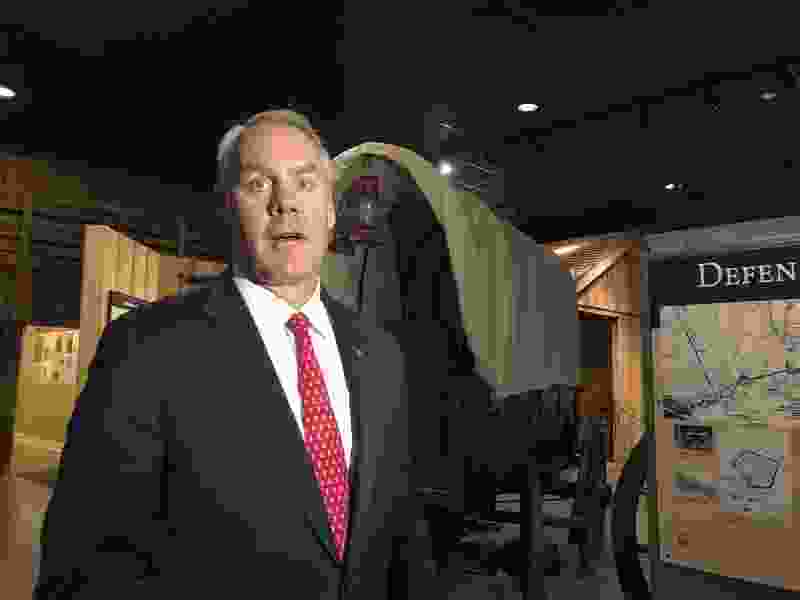 Interior Secretary Ryan Zinke said Saturday in visiting the monument that Trump used the Antiquities Act as it was supposed to be applied: preserving a site in the smallest form needed to protect it. Still, environmental groups charged that Trump was being hypocritical in using the Antiquities Act after being so highly critical of it previously, especially because the Bears Ears monument was sought by Native Americans who consider the southeastern Utah area sacred. SUWA is one of several conservation groups and tribes that sued Trump, Zinke and other government officials immediately after the president dismantled the two Utah monuments. The lawsuit, which contends the Antiquities Act allows the creation of a monument but not the removal of such a designation, continues in federal court in Washington. “However, all national monuments that recognize our diverse history must be protected and honored — including Bears Ears National Monument in Utah, where a coalition of sovereign tribal nations proposed and advocated for the monument,” Hartinger said. “Honoring Camp Nelson’s role in advancing equality while simultaneously working to strip protections from Bears Ears is disrespectful and hypocritical." The Center for Western Priorities' executive director, Jennifer Rokala, found irony in Trump using a law to create a monument while single-handedly working to weaken the Antiquities Act. Bishop, in a statement released Saturday, said the president’s action to create the Camp Nelson monument should be codified by Congress — and soon. “I am hopeful the Senate will follow the House and the president’s lead in giving Camp Nelson the prominence and security it deserves through the force of congressionally enacted law,” Bishop said, praising Barr for leading the effort to seek monument status. Barr’s race is considered a toss-up by the political handicapper the Cook Political Report and a New York Times/Siena College poll shows the incumbent with a 1 point lead ahead of the Nov. 6 election. Just over 22 years ago, Republicans slammed Clinton for creating the Grand Staircase monument, arguing that he was doing so to shore up political points with his Democratic base right before the general election.